Explanation: The 2001 Leonids Meteor Shower gave quite a show to many parts of the world yesterday during the early morning hours. Many sleepy observers venturing into their own backyards were treated to several bright meteors per minute streaking across the sky. This rate made the 2001 Leonids the most active meteor shower in over three decades. 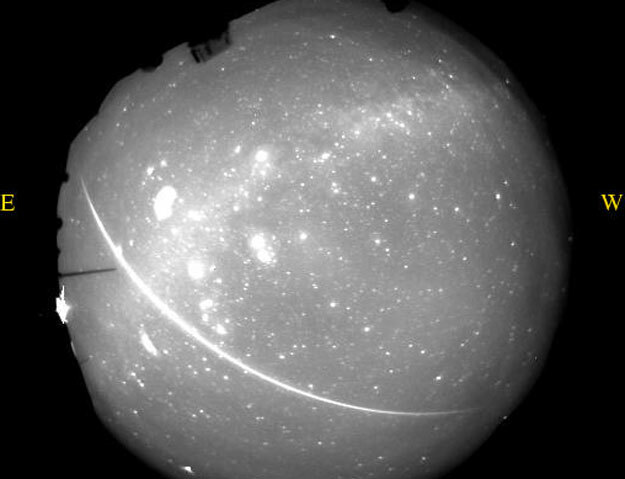 Pictured above is a bright Leonid fireball that briefly lit up Hawaii yesterday morning. 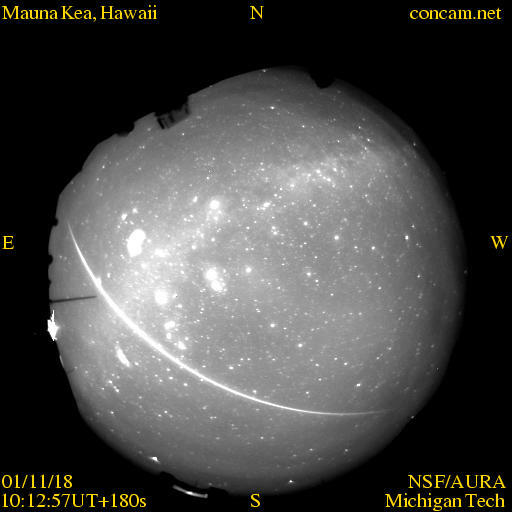 A CONCAM nighttime all-sky monitor on Mauna Kea, a dormant volcano, caught the bright meteor, seen as the very bright streak across the lower part of the fisheye image. The meteor track crossed the Galactic plane (the faint glow that runs from the lower left to upper right), passed below the planet Jupiter, and through the constellation Orion. CONCAMs in Hawaii, Arizona, and California all recorded numerous bright meteors during this year's Leonids.